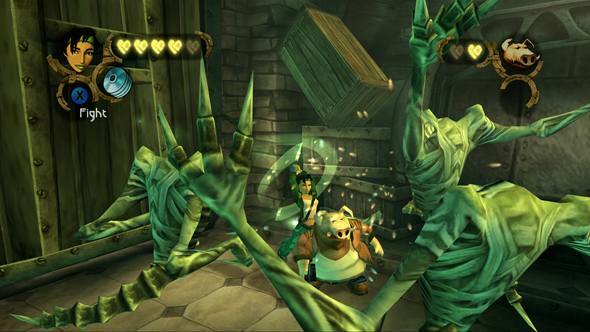 When it was first released, Beyond Good & Evil was hailed as what some called the “adult Legend of Zelda”. This was at the time of The Legend of Zelda Wind Waker and its new cel-shaded graphical style which was met by a lot of opposition who were claiming it looked far too childish. Although The Legend of Zelda is as suitable for adults as it is children (probably even more so due to some of its dark undertones and spooky enemies), you can certainly see where they were coming from. But, being compared to such a legendary series is not only an honour, but gives you, the consumer, an idea of the depth that’s on offer in Beyond Good & Evil. Set in 2435 on a distant planet, the story follows Jade, an investigative reporter trained in martial arts, as she slowly gets more and more involved with a resistance movement before eventually uncovering dark secrets and a planet-wide alien conspiracy. It’s played out through third-person action-adventuring, with a blend of combat, puzzling and stealth missions, so it’s no wonder comparisons have been drawn between this and The Legend of Zelda. The systems in place are actually fairly similar such as the way health is broken down into sections which deplete in parts as you take damage, but you can also earn hearts, thus increasing your overall life gauge. Combat is done using a combat stick but computer-controlled allies can lend a hand when you press a certain button to trigger their ‘super attack’, which usually help by making the enemy off-balance and more vulnerable to your own attacks. As Jade is an investigative journalist, the game also makes use of a camera, the control scheme of which is nicely mapped onto the shoulder buttons, meaning it’s out of the way for when you don’t need it, but easily accessible for when you do. While the camera features as part of the main plot path, it is also where Beyond Good & Evil does its very own take on collectibles. Along the way you are tasked with taking pictures of each and every species of animal on the planet. Doing so earns you special space pearls, one of the in-game currencies that is used for buying ship parts and conducting upgrades and repairs. These space pearls can be acquired elsewhere throughout the story too. 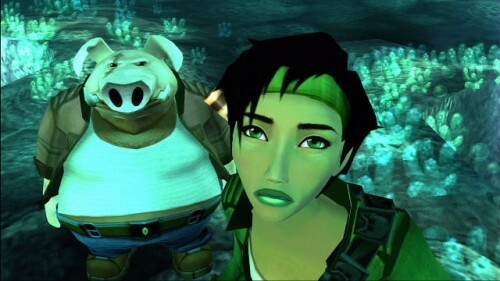 The story is truly one of Beyond Good & Evil HD’s greatest assets: the stunning cinematic cut scenes are incomparable to other downloadable Xbox Live Arcade releases. It may be old now, but Beyond Good & Evil is a retail game at heart and its retail production values remain intact and as such, far superior to those normally witnessed on the download service. 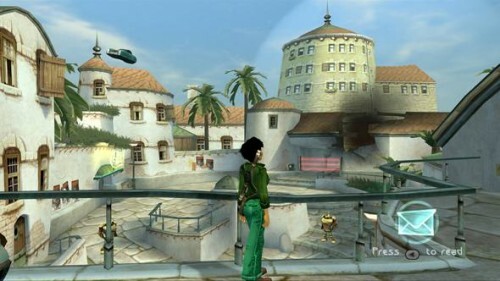 With excellent voice acting and a compelling plot it surpasses most other XBLA games simply because most of them will have had a remarkably smaller budget than Beyond Good & Evil did when it was produced for Xbox, PS2 and Gamecube. The storyline may not live up to the hefty task set by such a powerful title, but it’s more than adequate, if a little short-lived. 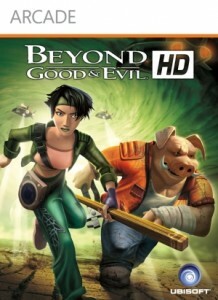 Technically, the HD tagline is a bit cheeky because, aside from controls to suit the Xbox 360 pad, Beyond Good & Evil is almost a straight port of the PC remake of the game. Yes, the graphics are great and the diverse in-game universe is genuinely impressive, but calling it HD is a bit of a stretch. That said, the visuals have definitely had a much needed polish from the last-gen original’s: textures have been smoothed, character models have been improved, and the sound quality of the soundtrack has been cleaned up. On the subject of the soundtrack, this is also brilliant and the emotive musical score contributes positively to the overall mood of the story, making it an even more engrossing experience. It may be wrong seeing as it isn’t a completely new game, only a polished port of an old one, but Beyond Good & Evil HD is a definite contender for being one of this year’s top XBLA games. As it was originally a full retail release of the highest calibre (which due to poor marketing flunked), it still holds those high production values which are unrivalled on the Xbox Live Arcade. This means diverse 3-D environments, a top-rate story with charming, amusing characters, and a decent story with professional voice-acting and cut scenes to boot. It still possesses some remnants of its past in the over-excitable camera and the occasional gameplay glitch, but for 800 Microsoft Points, you can’t really go wrong. If you’ve played the original then it doesn’t have much to offer other than a new coat of paint and added sheen, but for those who didn’t play it first time round, this fantastic adventure well worth having.